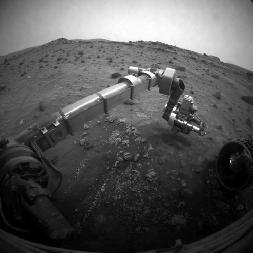 NASA boffins believe the space agency's solar-powered Martian droid rovers have found something interesting. They believe their discovery points to an increased likelihood of life on the Red Planet. "We're really excited about this," said NASA Mars-droid honcho Steve Squyres, according to the BBC. "This is a representation of... a local habitable environment." On Earth, places such as the one the rover has found are "teeming with life". Sadly, however, Squyres is talking about microbes which live in hot springs or geysers, rather than - for instance - beautiful alien sexpots desperate for some Earth lovin'. In fact, the NASA space-bots haven't found any microbes. Worse still, they haven't actually found any hot springs or any place where microbes could live. All they have found is some particles of silica, in fact - glass or sand. The space agency boffins reckon this could only have been produced by some kind of process involving very hot water. Hence their excitement. So this could be evidence of a habitat existing at some point in the past that could have supported microbial life. That sounds like a good enough reason for a permanent manned Mars base to us - in fact, it could easily justify a huge, horribly beweaponed space battlefleet, just in case the microbe-men of Mars turn nasty.